The loyal blue runs deeps in Matthew Barker’s roots. With multiple family members attending or teaching at Louisiana Tech over the years, the senior finance major from Bossier City knew from an early age that he wanted to be part of the Tech family. “Ruston has always been a second home for me and Tech was my playground as a child whether I was cheering on the Bulldogs at athletic events or roaming around the quad on my Uncle’s Segway he had in his office in Bogard Hall,” said Barker. The decision to major in finance, though, wasn’t initially as clear. Barker knew he wanted to pursue a career in business, but didn’t decide on an actual academic path until his senior year of high school when he realized he had a passion for financial markets and their impact on the world. Today, Barker’s passion is funneled into action through hands-on learning like investing money through the Student Managed Investment Fund course — an experience he noted is his favorite part of being a finance major. Dr. McCumber, along with Dr. Jun Duanmu, have impacted Barker in the classroom with their “ability to teach beyond the textbook and the fact that they genuinely care about the students and their success.” He has even found a mentor in Dr. Chris Martin, dean of the College of Business. 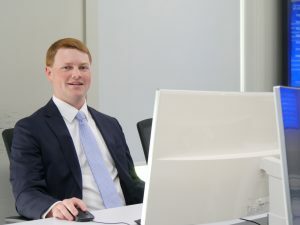 Now, Barker has the opportunity to take his financial skills and impact others as a credit analyst with Texas Capital Bank in Dallas, a position he was offered after completing a summer internship as a credit underwriter. After completing the development program, Barker will officially be a credit underwriter, a role he is prepared to take on thanks to his academic experiences.